Product description: Add sweetness into your relationship by sending people close to your heart this Amazing Dom Perignon Gift Set that is sweet as your pure love. 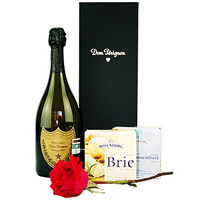 This elegant gift includes 1 bottles of Champagne Dom Perignon 750ml and it is complemented with delicious taste of cheese 1 Brie Danish cheese 125grs and 1 Camembert Danish cheese 125grs. We deliver this item Same Day in 95% of orders. 5% orders may also be delivered next day without notice in some of the locations for reasons beyond our control. Let your loved ones dive into the pool of flavors with this Amazing V-Day Arrangement of 24 Long-Stem Red Roses you send them to make their occasions special. 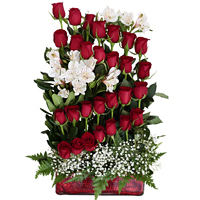 This diagonal arrangement of 24 Red Roses comes accompanied with Green Foliage in a Glass Base. 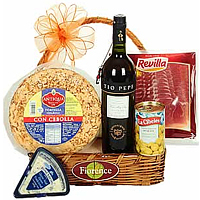 Ideal basket for the most demanding palates those who enjoy the most exquisite flavors from Spain.Content: 1 Tio Pepe sherry wine 750 mls.1 Spanish tortilla 750grs.1 Spanish serrano ham 200grs.1 Danish blue cheese,1 Imported olives 300grs. 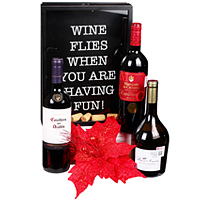 This contains:Original collector of corks, made of wood and glass, with the phrase Wine flies when you are having fun!, Red wine Casillero del Diablo 750 ml. Red wine Marqués de Cáceres 750 ml. Red wine Baron Maxime 750 ml. 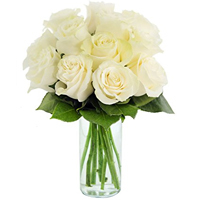 Roses arranged in a vase. Gift someone you love this Expressive Valentines Magic Flowers Collection to steal his/her heart. 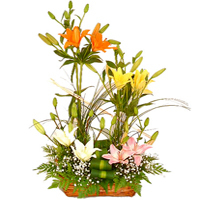 Send this timeless symbol of perfect romance this Valentines Day with this attractive Bouquet of Seven Lily Stems decorated with Lots of Greenery n Fillers. 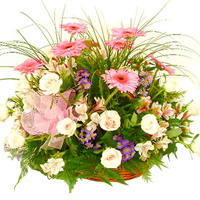 Earn appreciation for sending this Exquisite Valentine Celebration Bouquet to your loved ones. Send this perfect Bouquet for special one on Valentines by gifting this Bouquet which contains 12 Rose Stems, 6 Gerberas Daisies and Lots of Greenery.